Award winning wine expert and columnist Olly Smith travelled with us to New Zealand in February 2014 where he discovered the delights of the country’s most northerly region. Discover the World has a collection of 5-night ‘Travel Less, See More itineraries‘ throughout New Zealand, which mean they can create holidays where the pressure is off but the adventures are still electrifying. If you’re visiting the land of bubbling mud, snow-capped volcanoes and gentle seas (which make your toes unfurl in sheer delight! ), my taster trip to the Bay of Islands convinced me that these are the go-to guys. I started in Auckland, one of the world’s most intimate and dynamic capital cities. 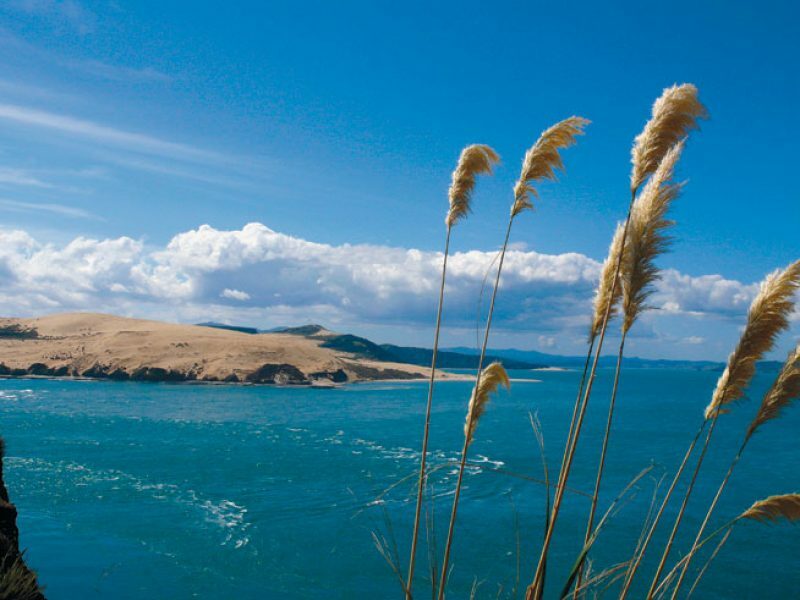 A third of New Zealand’s population live here (1.3 million) among the 800 parks, 48 volcanic cones, 50 islands, three harbours and two mountain ranges. My first stop was Mollies, a boutique hotel impeccably decorated with quirky sculptures, tasteful exotic art – the perfect (and homely) base from which to explore the city. It has recently been taken over by the wonderful Bernadette and Steve – who absolutely insisted on carrying my heavy bag up several flights of stairs, while sporting a broken toe. There’s no stopping the man! I took a run down to the shore through Point Erin Park – which has sublime views out to the sea – and was rewarded with a splendid breakfast of avocado, heirloom tomato and a perfectly poached egg. Set up for my trip, I hopped in the car and rolled north to The Bay of Islands. 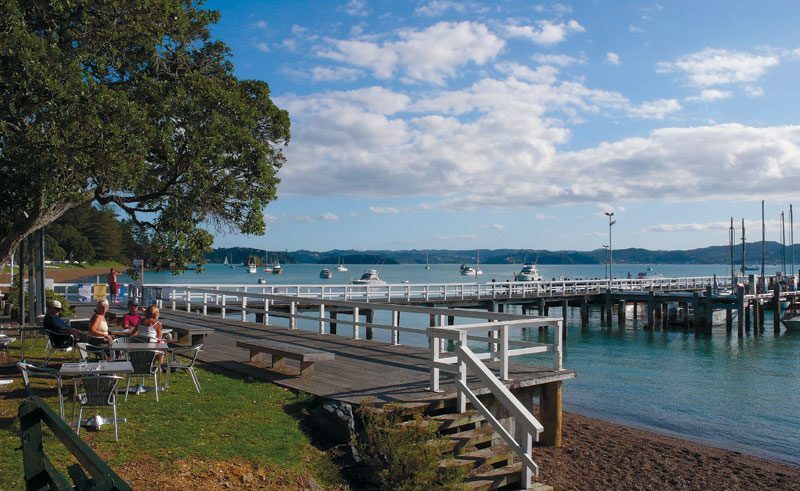 Heading north from Auckland, the scenery is enough to make the gods of Olympus sigh with envy, and there are plenty of places to stop and soak in the epic landscape, from the beach at Orewa to the hot springs at Waiwere. The roads are a doddle too – once you’re out of the city, you can wave traffic goodbye; hours drifted by when I barely saw another vehicle. Further on, Puhoi Pub has plenty of refreshment and Kaiwaka is the spot if cheese is your thing – try the local Dutch examples. I stopped off the highway at Waipu for a coffee in Wild Thyme, a decent deli with a warm welcome if you need to stock up on provisions or just perch for a moment to revel in the sunny splendour of the North Island. You can take the ferry from Opua to Russell (a quiet and quaint beachfront town) to hasten your journey, but I was enjoying the drive so much that I elected to take the long and winding road to my evening’s rest – the kind that would make the lads from ‘Top Gear’ drool. Of course, I love wine from New Zealand – but their craft beers, made with local hops, are unmissable too. In fact, the beer list (as well the excellent food) at the Duke of Marlborough Hotel in Russell made me grin with glee. After a plate of fresh oysters, eaten overlooking the sea, I turned my attention to sampling some of those local hand crafted beers. Tuatara APA Aotearoa Pale Ale was delicious, and with a generous dose of Pacific Jade, Cascade, Sauvin and Wai-iti hops, every bottle delivers a richly textured sip with an electrifying tang similar to orange bitters. Next came a cool glass of Epic Pale Ale. With 28 different hops, Epic has a rose-like fragrance – almost a whiff of Turkish Delight, followed by deliciously tangy bite and a richly satisfying sense of oomph. I would have loved to have sampled more but with an early start ahead, I retired to my room with its tranquil and inviting view over the water. Next morning, I was up early to take a trip to see the dolphins with Explore Group Limited. If the conditions are right you can get in the water and swim with them, but on this trip we were lucky enough to see a baby dolphin, which precluded taking a dip. I will treasure the memory of just seeing so many of them jumping, diving and splashing off the gloriously green coastline though. Heading ashore, with the rest of the day ahead, I took the local car ferry to Paihia for my stay at The Sanctuary, which is run by Yogi, Glynnis and Charlie the spaniel. The view over the woodland to the shore is jaw-dropping, with more spectacular views to be had from every window and from the cosy infinity pool. No wonder my hosts were so warm and kind; living with that much beauty must rub off. Picking up on my love of craft beer, my hosts bought me a cold Mac’s Hop Rocker Pilsner (5%) which was as zesty, bouncy and snappy as a golden crocodile on a trampoline. “Every day is a good day”, smiled Yogi, “but some are better than others”. If only they could bottle him! The Sanctuary lives up to its name; it’s Yogi and Glynnis’ home, their world, and they make you feel like family. For my final day, I’d hoped to travel up to Cape Reinga on a scenic flight with Salt Air but alas the weather didn’t play into our hands. 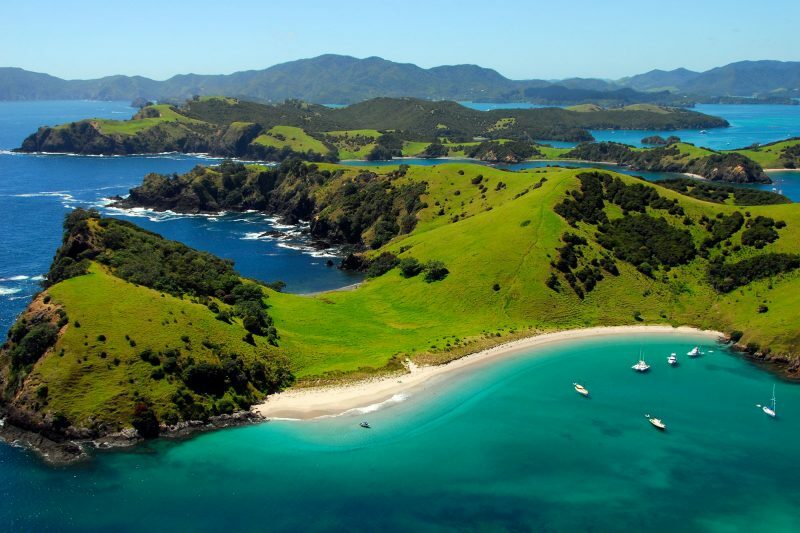 Instead, I booked myself a jet ski safari with Tango Jet Ski in Paihia – by far the most exhilarating excursion of my life. I’ll admit that my nerves jangled a tad as I guided my jet ski out across the swell (which felt as high as a bus) but I was in very good hands with Ben Fewtrell as my guide. Ben has almost finished his training as a paramedic and is a volunteer fireman. In short, you couldn’t be out on the water with a more excellent chap. Gliding across silver-edged sunlit seas was, in Ben’s words, “sweet as” (which I’m 99% certain means “jolly good”). He showed me Cook’s Cove where Captain Cook first dropped anchor, a millionaire’s beach house where the owner “choppers in to land on the lawn” and, climbing ashore on another of the many idyllic islands, we scrambled up to a vantage point to see the ocean laid bare in a glittering cascade of deep azure. On the way home, Ben urged me to connect with my inner speedster and I managed up to 85 km/h before we had to tackle the choppy crossing home, and I loved the epic swell-and-trough-tackling voyage so much that I instantly booked another half hour to go up river with Ben to learn some stunts. As I managed my first 180 degree turn, he paid me the highest complement possible on a jet ski (I think) when he cheered “you’re tearing it up like a hooligan!” Afterwards he took me for a local treat – a steak and mushroom pie at the bakery. If you end up in Paihia you can’t miss Ben, he’s the blonde bloke on the quay by the jet skis who never wears shoes. And he’s a mine of local information. That afternoon he sent me off to find Rainbow Falls which is a little off the beaten track. You can swim across the plunge pool of this spectacular waterfall and go under the cascade to explore the cave behind the falls. That night, back at The Sanctuary, I feasted on Glynnis and Yogi’s exquisite cooking (and the view out over the water) with honeymooners Vicky and Robin from the UK and another couple who were celebrating their 40th wedding anniversary. Our celebrations were cheered on by enthusiastic local birdlife, and it couldn’t have been a more glorious end to my trip. In fact, Discover the World delivered a flawless mini break that recharged my batteries as though my very spirit had been plugged into the mains. Now all I need is a portable New Zealand to be my permanent power station.